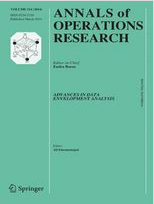 This special issue is to celebrate the 40th anniversary of the publication of the seminal paper on Data Envelopment Analysis (DEA) by Charnes, Cooper and Rhodes. The paper was a milestone in the broader area of efficiency and productivity analysis and it has given rise to a very large number of theoretical developments and empirical applications in the field. In this Special Issue we expect high quality original research papers. We would especially welcome contributions to the methodology of DEA as well as innovative applications of it to real life problems such as regulation, finance, healthcare and education to name but a few. Please note that this proceedings has been published and can be cited as follows. To download the full proceedings pease CLICK HERE. This is a post-proceedings and the deadline for full paper submission to appear in the proceedings is May 15, 2018.